PORTLAND, ME – The Fish Vet Group (FVG) is more than just another private fish health lab. It has a global presence encompassing diagnostic service, vaccine and pharmaceutical development, biosecurity products, and a wealth of knowledge on health, welfare, and husbandry issues. In this issue we’ll look at FVG’s Portland facility and how the personnel there serve clients as varied as the salmon farms of Downeast Maine to the catfish ponds in the Delta. The Portland center was opened in 2011 with Hernan Pizarro and Jason Collins joining FVG to provide aquaculture health services to producers of farmed fish, shellfish, and crustaceans across the Americas. Pizarro brought 15 years of experience that included developing improved pathology processes specific to the aquaculture industry, and the commercial introduction of clinical services and vaccines focused on salmon and tilapia. Collins provides a link between biotechnology companies and fish producers and has worked extensively in North America, Canada, Chile, Norway, and the United Kingdom. In late 2014, Hamish Rodger, BVMS, PhD took on the role of global managing director, with responsibility for coordinating the company’s clinical and diagnostic operations in Scotland, Norway, Thailand, USA, and Ireland. 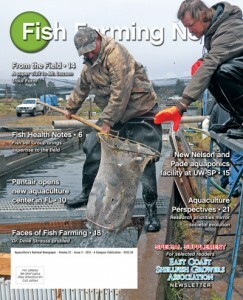 …read the rest and much, much more in Issue 3, 2015 of Fish Farming News. Purchase this issue to download access instructions so that you can read the online flip-book AND download a pdf copy for future reference. ONLINE SUBSCRIPTIONS are now FREE!! SUBSCRIBE NOW!! COMING SOON … 2018 DIRECTORY!! !